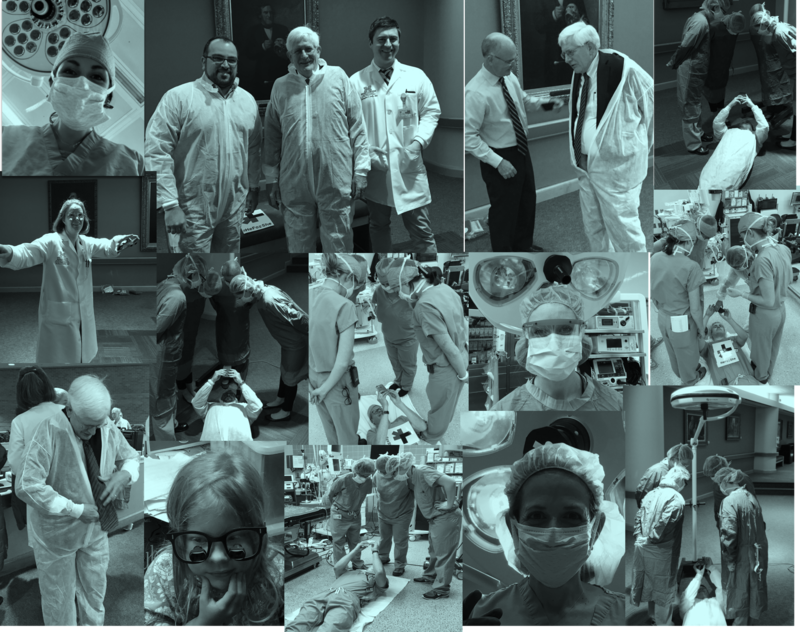 The Department of Surgery launches innovative initiatives. Dr. Meredith Barrett, a fifth year general surgery house officer at Michigan Medicine, recalls countless incidences where she has headed into a patient's room to discuss their diagnosis, only to have them ask the younger male intern in the room for his opinion. It's not intended to be malicious, she said. "It's just that historically men have been the surgeons, so it's something that makes it more challenging for women." Dr. Barrett is used to being a minority; she's the only woman in her class. That's not surprising, since nationally, only 19 percent of surgeons are female, presenting challenges for Surgery Departments seeking a diverse faculty. But Barrett says Michigan is leading the way in its commitment to making women feel welcome and valued through numerous initiatives. It's a view shared by other female surgeons in the Department. Dr. Barrett explains that general surgery at Michigan has historically "been a boy's club, of sorts," but she says that's no longer the case. She cites the Department's support for many programs targeted towards women. One of those is the Women in Surgery group that she launched in 2013. It's comprised of female faculty and residents who meet a few times a year for social events and to discuss issues affecting female surgeons; an average of 20 to 30 attend each event. The meetings have provided an informal way for women to get to know each other outside the operating room, she said. The effort sprang from Dr. Barrett's realization that her needs were different than those of her male counterparts and she wanted to find a way to connect with successful female surgeons who balanced a family with a high powered, time-intensive career. "Every single one of the women provide a unique perspective and insight into how they are able to balance things," she said. She includes Dr. Dawn Coleman, her faculty mentor who is also a mother, in that category. "She's someone I can look up to and ask her how she does it." As part of the Department of Surgery 2017-2018 Leadership Development Program, the Department of Surgery has coordinated a one day symposium for faculty and trainees in June. It will focus on the topic of Gender Diversity in Leadership, exploring the ways the department can enhance diversity and leadership through the lens of gender. "This forum will serve as a great venue to exchange ideas and perspectives on this important topic," said Dr. Jennifer Waljee, who has been involved in coordinating the symposium. The Michigan Department of Surgery "is an incredibly positive environment that aims to allow all faculty to grow to their fullest potential," she added. She said the upcoming opportunities will allow faculty to identify the strategies and pathways needed to create a vibrant and diverse faculty going forward. She points to prior research which has clearly shown that organizational diversity "yields strength, creativity, productivity, and longevity, all of which are critical in surgical disciplines." Dr. Barrett said that a diverse staff that includes more women will lead to the best patient care. "Patients are a diverse group and if we're not a diverse group of providers, we'll be missing something." When Dr. Dana Telem, an associate professor of surgery, arrived at Michigan in September, 2016, she quickly connected with other female faculty, discussing issues facing women. This led to the establishment of the Michigan Women's Surgical Collaborative.  The kick-off event is the Michigan Women's Leadership and Surgery Conference November 10th and 11th. It will be targeted to junior faculty and residents, "touching on topics central to becoming who you want to be," Dr. Telem said. Her impressive slate of speakers includes a business professor and a U.S. Congresswoman, along with leading female chairs and vice chairs of surgery departments around the country. The meeting will provide opportunities for networking and community building and self discovery and coaching, focusing on leadership style and conflict resolution. Presenters and attendees will also share personal experiences and success stories. Dr. Telem is expecting residents and faculty from throughout the U.S. to attend and predicts it will be successful. "We are leveraging and harnessing the resources that are unique to Michigan to put this on." Dr. Telem said what's most empowering about the conference is that it's entirely funded by Chairman Michael Mulholland through the Department of Surgery. Supporting an expensive conference indicates that diversity and inclusion are a priority to the leadership, she said. Dr. Barrett said the measure of whether a program is inclusive in large part can be determined by its leadership. She said Dr. Mulholland "forever and always will be a proponent for women," citing his goal to ensure incoming classes of residents are half female. "He sets the tone and that tone is felt throughout the residency program," she said. Dr. Telem said the conferences providing open dialogue will "help to move the needle" in identifying the challenges that female surgeons face and how to address them. She expects Michigan will be a leader in this area. Dr. Waljee said the upcoming conferences are "a fantastic opportunity for us." 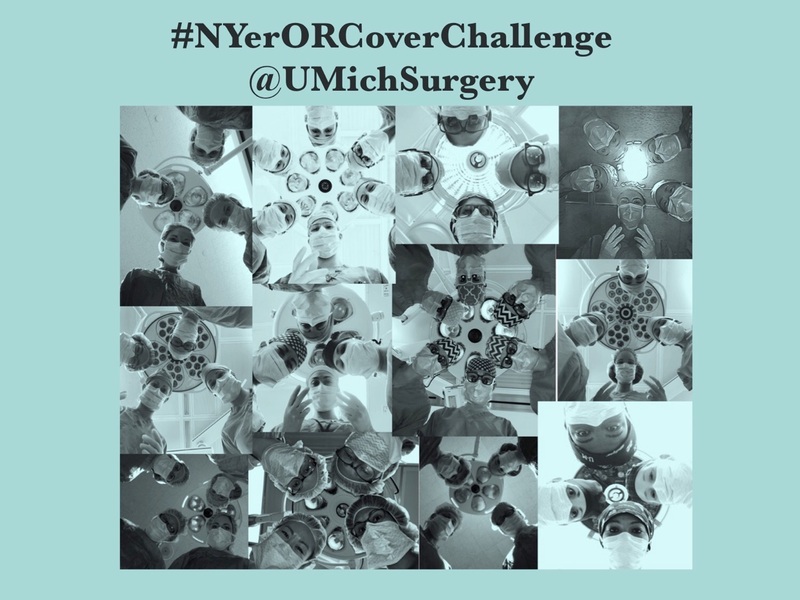 The Surgery Department also was involved in a national social media campaign, The NYerORCoverChallenge, which started with a New Yorker cover of female surgeons surrounding an operating table and was promptly replicated by female surgeons all over the world. Dr. Barb Miller, an assistant professor in the Department of Surgery, was intrigued with that campaign and by a photo posted by a male surgeon at Ohio State University with the hashtag, HeForShe, showing his support for women in the Department. Vowing not to be outdone by Michigan's rival, Dr. Miller got Dr. Mulholland's support to follow suit. 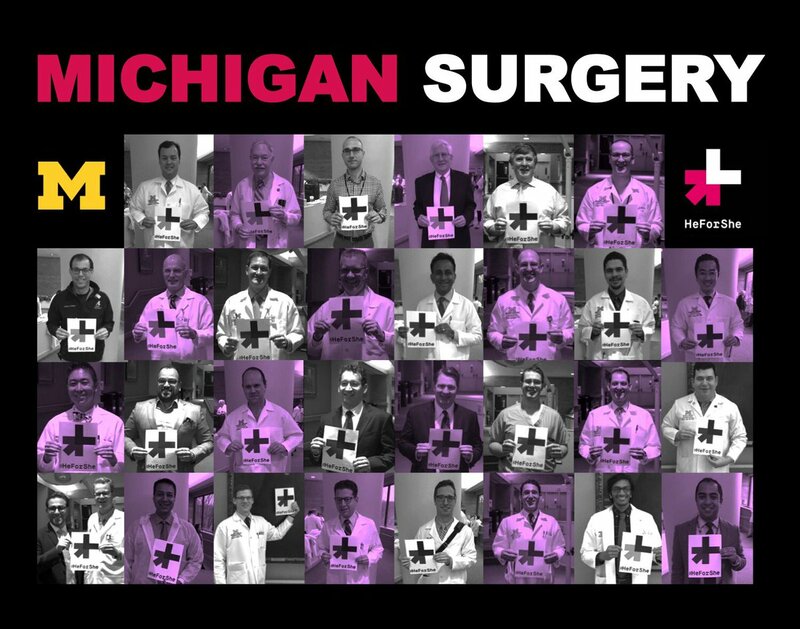 In April, she spearheaded an effort to have numerous photos taken, some just of female surgeons and others with male and female surgeons together, which demonstrated how male surgeons at Michigan supported women. She tweeted out the photos and challenged others to post their own HeForShe photos. Dr. Miller said this type of social media movement is crucial in raising awareness, which leads to male colleagues understanding it's acceptable to show support for the women they work with. "There's been a lot of support from the [Michigan Surgery] Department in pushing the envelope in terms of gender equality and really trying to address that," she said. "That's not seen in a lot of places." Dr. Barrett agrees. She says the culture of inclusion she's experienced at Michigan "makes me insanely proud. I hope to continue that culture in the future." Read the New Yorker piece that inspired the #NYerORCoverChallenge. Follow @UMichSurgery on Twitter and join the conversation.